Arsenal can now be added to the list of clubs who had lower attendances than Newcastle United last (2017/18) season. Tuesday brought revelations from BBC Sport (see below), using Freedom of information and getting true numbers from the various Police forces, which proved that crowd figures published by many Premier League clubs last season, were very different to how many people actually turned up. A combination of people buying season tickets not turning up, as well as big ticket give aways for free, where those tickets are still counted even if not used. Newcastle United’s average official attendance last season was 52,167, which put them seventh highest in the Premier League. However, BBC Sport obtained the figures which showed that over the 12 home matches they got the figures for, for both clubs, they showed Manchester City actually averaged 45,792 last season when it came to fans in the stadium – over seven thousand less than what the attendances they published. Whilst for West Ham it was even more stark, BBC Sport finding out that their average over the 12 home matches they had figures for, was only 42,779, compared to the 55,309 average crowds they happily announce/claim. These revelations simply back up what everybody could see with the naked eye, thousands and thousands of empty seats on display week in week out at the likes of West Ham and Man City. A follow up by BBC Sport has now heavily backed that belief about Arsenal. The BBC spoke to the respected Arsenal Supporters Trust (AST) who have been monitoring this problem for some time, a source of much frustration to them. Every single match at the Emirates it is embarrassing to see just how many empty seats there are. The AST have estimated that last season they averaged only 46,000 at Premier League home games compared to the 57,054 which the club announced. The BBC weren’t able to get figures this time from the Police for Arsenal’s attendances but fair to say you can trust the Arsenal Supporters Trust over their club. They find it a disgrace that so many thousands of their fellow ‘fans’ don’t bother turning up on a regular basis, when there is a big waiting list for one of the 48,000 season tickets sold. The AST’s Tim Payton says every empty seat is “a tragedy for those who want to watch but can’t get in”. The reality for Newcastle United is that whilst there were some empty seats at times last season, there was clearly an average inside St James Park of over fifty thousand, making NUFC the fourth biggest supported team last season, behind Man Utd, Surs and Liverpool (see below). ‘Football finance expert Rob Wilson believes publicising ‘tickets sold’ attendance figures is done for commercial reasons. West Ham’s biggest difference in figures was 17,523 fans for the home game against West Brom on Tuesday, 2 January 2018. The official attendance was 56,888 but the council said it was 39,365. The Hammers’ matches against Chelsea and Arsenal in December had a discrepancy of 11,953 (56,953 – 45,000) and 14,721 (56,921 – 42,200) respectively. Manchester City’s largest discrepancy was 15,277 for the visit of Southampton on Wednesday, 29 November 2017 (53,407 compared with 38,130). For games over the festive period, there was a difference of more than 9,000 fans for City’s games against Bournemouth (54,270 – 44,406) and Watford (53,556 – 44,207). But there was still a difference of 8,687 (54,214 – 45,527) for the 4-1 win against Tottenham on Saturday, 16 December; 4,218 (54,286 – 50,068) for the 3-1 victory against Arsenal on Sunday, 5 November; and 5,524 (54,172 – 48,648) for the 5-0 win over Liverpool on Saturday, 9 September. Tottenham’s largest discrepancy was 8,686 (55,124 – 46,438) for the game with Brighton on 3 December. Four of the six Chelsea matches that Hammersmith and Fulham Council attended were European games where the difference ranged from zero for their last-16 Champions League tie against Barcelona on 20 February (attendance 37,741) to 5,222 (41,150 – 35,928) for their group game against Qarabag on 12 September. For two Premier League fixtures the difference was 6,345 (41,364 – 35,019), for the visit of Tottenham on 1 April, and 3,096 (41,324 – 38,228) for West Ham a week later. No matter how much money is spent on players and how many trophies are won, Manchester City still never seem to be able to fill their stadium. Their fans have become very defensive about the issue, claiming there might be the odd seat here and there, whereas for visiting fans and those watching on TV there are clearly thousands of empty seats every match. Using the Freedom of Information, BBC Sport asked every Police force to provide figures for what were the actual crowds (number of people who went to the games) at each Premier League club in the 2017/18 season, to find out whether they tallied with the claimed ‘attendances’ that were announced after each match. ‘Most teams in the Premier League choose to publicise the number of tickets sold for a game rather than the number of people actually in the stadium. That means they include season ticket holders who don’t attend, and complimentary tickets that are not used. They are not breaking any rules by choosing this method. BBC Sport were knocked back the majority of Police forces who said they did not hold that information and simply directed them to the figures published by clubs. However, they had better joy with seven clubs. With Manchester United, it was claimed that their figures exactly tallied, announced crowds the same as how many actually showed up. However, the six others were significantly different, massively so in the cases of Manchester City and West Ham. As you can see, the figures for West Ham and Manchester City were based on the stats from 12 home matches each. For West Ham it showed an average of 42,779 attending games and not the claimed 55,309 – a huge 12,530 less. Meanwhile, Manchester City were almost as bad, their crowds 7,482 less on average, 45,792 and not the reported 53,274. The overall (reported) average attendances for the full 2017/18 season are below. Whilst BBC Sport were unable to get any exact figure response regarding Newcastle United, that 52,157 average attendance should be pretty close to the true figure of how many actually attended. Any empty seats last season certainly not taking the average down under 50,000, never mind anywhere near the 42k and 45k attendances for West Ham and Manchester City respectively. At Anfield, Liverpool always looks full, whilst clearly Man Utd and Spurs were well out of reach last season. 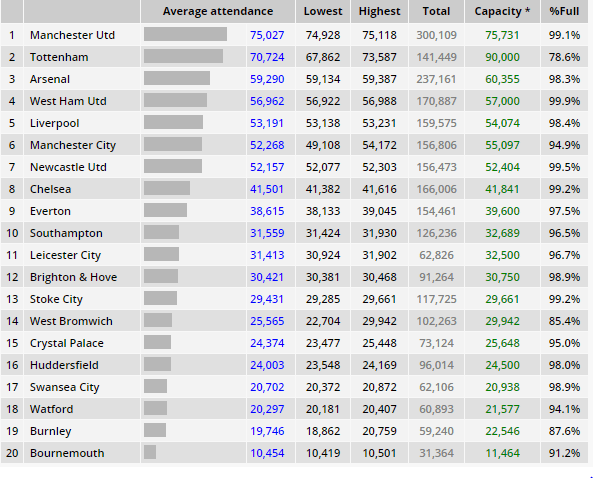 However, it looks clear that Newcastle had at least the fifth highest average crowds last season, and whilst there are no true figures for Arsenal this time, they are regular offenders in the past when it comes to crowd figures not matching up to the truth. Last season the Emirates looked like it had even more empty than usual as their poor fans didn’t finish top four, so I would hazard a guess that there is every chance Newcastle’s crowds were very close to or even higher than Arsenal’s last time. This season however, it is already looking like Mike Ashley has at last managed to sicken enough fans so that St James Park won’t sell out regularly, if at all. The Chelsea and Spurs games didn’t sell out and Arsenal still has seats available three days ahead of the game, these three attractive matches usually sell out straight away, plus all three clubs have sold their full 3,2000 away allocation.